The Energy Doctor is based on the groundbreaking ERA – Energy Recovery Awareness – approach to health, relationships, work, creativity, happiness and spiritual development. 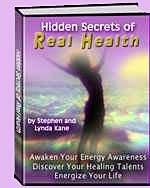 Stephen Kane explains how Electromagnetic Hypersensitivity and other forms of Environmental Stress can affect our health, but that simply blocking the energies is not the right approach. 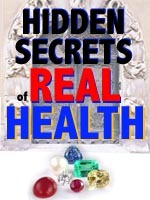 He argues that a new paradign of whole body awareness can resolve many environmental issues by addressing the root cause. Environmental stresses come in many waveforms and frequencies. Some affect your health and others your relationships. Some stresses reduce your happiness and others damage your awareness. The only factor they have in common is that they damage an area of you or your life by displacing your life energies from where you need them to be. A major difficulty with understanding the role environmental stress plays in each person's life is that this role is so different from one person to the next. In other words, each person's vulnerability to each form of environmental stress is extremely varied. For example, one person uses a mobile phone and experiences a burning sensation, headaches, blurry vision and fatigue whereas the next person feels fine. Consequently, the millions of people who suffer from hypersensitivity to electromagnetic fields are not significantly helped by current science which can, at best – and by no means always – only measure statistical correlations between the incidence of certain symptoms or diseases and certain electromagnetic fields – but without being able to explain why these correlations exist. People who experience electromagnetic hypersensitivity commonly make the mistake of assuming that electromagnetic fields in their environment are the primary cause of their condition. They then often spend much time and money trying to reduce their exposure to electromagnetic fields just as people with food hypersensitivies often focus on avoiding certain foods, using special nets on their windows, special paints, special flooring etc. Even though this approach is effective to the extent that it partially reduces symptoms, it's ineffective (on its own) as a means of treating the root cause of hypersensitivity. In other words, while the management of electromagnetic hypersensitivity is better than merely suffering it, steadily reducing it is best of all. Consequently, people who have been raised in a Western culture and who suffer from electromagnetic field hypersensitivity, tend to think in terms of electromagnetic fields – even though electromagnetic fields are not the root cause of their condition. This way of thinking ultimately limits individuals' ability to recover from electromagnetic hypersensitivity since they can only conceive of solutions inside this particular framework... In this field, in order to help people reduce their hypersensitivity to foods, electromagnetic fields or even other people, it's necessary that we start with energetic first principles rather than automatically subscribing to current scientific axioms. Electromagnetic hypersensitivity starts with a particular kind of lesion in the human energy field – but not the electromagnetic human energy field that can partially be observed through, say, kirlian photography. The human energy field that underlies electromagnetic phenomena can be called a "chi", "qi" or "ki" field since these are terms used to describe a form of energy that has been studied in the East for millenia – but very little in the West because there's no instrument here, as yet, for measuring it. The lesion occurs in a part of the human qi field called the "6th chakra," which is an energy body organ that controls the autonomic nervous system. The lesion affects a particular area of the 6th chakra, called the "left root." This is where the chakra connects to a meridian or channel of qi called the ida in yoga. To be technical for a moment, a 6th chakra lesion with (i) a horizontal component that (ii) affects the left root, automatically causes electromagnetic hypersensitivity – the forms and degrees of hypersensitivity depend on how much of the 6th chakra is affected. We treat individuals suffering from electromagnetic hypersensitivity through a wide variety of methods designed to seal or close this lesion. The more this form of energy body injury is reduced, the less electromagnetically hypersensitive a person becomes. Through this approach, we have seen, over 25 years, people who could not tolerate electrical sockets, fluorescent lights or applicances of any kind, ring mains or mobile phones reduce their vulnerability to electromagnetic fields to the point where they no longer need to take special precautions in order to function well. The list of available methods for reducing electromagnetic hypersensitivity is too long to discuss in this article but two well-known aids to reducing hypersensitivity are the Energy Egg and Guardian Angel. Although these are not complete solutions in themselves, they can make an enormous difference to an individual's ability to respond to other forms of treatment. Electromagnetic fields are only one potential form of environmental stress. What is more, they are what we call "secondary stresses." In other words, the 6th chakra lesion that causes electromagnetic hypersensitivity is almost always caused by other forms of environmental stress which then make the person extra-sensitive to electro-magnetic fields. This is one of the reasons why focusing exclusively on electromagnetic fields is such a weak approach to dealing with electromagnetic hypersensitivity. 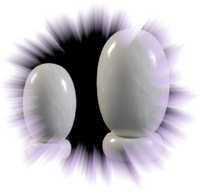 The Energy Egg, by way of contrast to such an approach, focuses exclusively on the qi field of its owner. It doesn't distinguish between stresses received from mobile phones, cars, other people or unfortunate works of art. All it does is register when the human qi field is being compromised by any incoming signal. 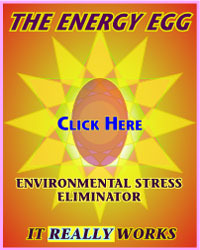 It then, as is explained in The Extraordinary Energy Egg, enhances your body's natural ability to eliminate or ground out the environmental stress. The Energy Egg also steadily reduces your body's accumulated stress burden – that is, the environmental stresses you have picked up over the years, which have not been eliminated by your energy body – including those in your 6th chakra. The more your stress burden increases, the more susceptible you become to suffering from a chronic injury or disease. "I am back to my energy from six years ago, and sleep like a log again"
The Guardian Angel functions differently from the Energy Egg, insofar as it identifies and eliminates environmental stresses before they even reach your qi field. The advantage of this is that the Guardian Angel emits a similar stress-elimination signal to that of the Energy Egg but doesn't require your energy body to receive the stress before eliminating it. In other words, environmental stresses are grounded out of the environment rather than out of your qi field. This can be of invaluable benefit to people who are particularly vulnerable to certain environmental stresses. For those who are most hypersensitive, we recommend an Angel Egg – an Energy Egg connected to a Guardian Angel – that can be used to retune a Guardian Angel whenever a new environmental stress of any kind is being experienced – especially necessary for very sensitive people. The Angel Egg is also a remote transmitter for the Guardian Angel providing all the enhanced power and protection of the GA when its owner is outside it's space clearing range. One confusion that sometimes arises for people who suffer from electromagnetic hypersensitivity is whether a Guardian Angel can actually eliminate an electromagnetic field from their environment. This confusion arises from the idea that a certain electromagnetic field is, itself, the cause of their problems – in spite of the fact that the majority of people who are exposed to the same signal don't suffer from the same problems... so it's not something inherent in the EM field or signal. Even though there is an upper limit to the tolerance of the human body for any form of energy – be it a certain form of electromagnetic field, a Rolling Stones concert, gamma rays or drinking water – there are, nevertheless, malfunctions that can occur in individuals' energy bodies that cause personal hypersensitivities to levels of these energies that would, otherwise, be well-tolerated. So this brings us back to the concept of electromagnetic hypersensitivity being a personal energy field problem rather than a universal environmental problem. As long as one subscribes to the latter point of view, one risks spending one's life battling with the presence of electromagnetic fields rather than working towards a real solution by reducing one's own vulnerability to them. Each of these processes proceeds at its own pace in each chakra of the body of whomever is within the Guardian Angel's field – any number of people. For example, for those who are particularly hypersensitive to electromagnetic fields, the balancing of the left and right channels of the 6th chakra will proceed much more slowly than in someone who doesn't have a large 6th chakra lesion. The primary environmental stresses for an electromagnetically hypersensitive person will always include other people's energies. There is almost always an element of chronic infection too – possibly dating from a respiratory infection or a vaccine – which requires other interventions. Electromagnetic fields at a normal signal strength are not, in themselves, primary stresses – even though they cause allergic reactions in vulnerable people. This is why the Guardian Angel does not respond to electromagnetic fields directly anymore than we would attempt to "desensitize" someone to a food allergen. Effective treatment addresses fundamental causes, not hypersensitivies resulting from those causes. Whenever you catch a cold, you develop temporary hypersensitivies to certain foods – but there's no point in trying to treat a cold by desensitising yourself to those foods. Once the cold – the "primary stress" – has cleared up, the consequent hypersensitivies – "secondary stresses" – clear up too. Using the Energy Egg and Guardian Angel is the beginning of a process of eliminating large quantities of primary and secondary stresses that have built up in your energy body and qi field over many years. The beginning of this process can be quite unsettling for people who are not energetically robust since they will not be used to significant quantities of environmental stress being eliminated from their bodies. This is why we suggest that very sensitive people increase their use of the Energy Egg or Guardian Angel slowly so their energy body can get used to the stress-elimination process. With your eyes closed, tap three times with your Energy Egg on your 6th chakra (centre of the forehead) then do three "weaving breaths" on your Energy Egg (in breath nose, out breath mouth) before opening your eyes. This technique, which helps seal the 6th and other chakras, is even more powerful when performed with an Angel Egg. It can, if necessary, be performed as often as every hour. Even though there is, quite rightly, a growing concern about the electromagnetic smog that is increasingly invading every home, hospital and school, personal electromagnetic hypersensitivity is a different issue. Apart from taking direct action against mobile phone masts and other such sources of electromagnetic pollution, little can be done to significantly improve the electromagnetic environment in which we live, and it's likely to only get worse. Nevertheless, you can do a lot to improve your ability to live in an environment where such signals are inevitably present. Rather than developing a siege mentality – which tends to box people into a smaller and smaller corner of increasing hypersensitivity (the same phenomenon often occurs for people who believe that avoiding foods is the answer to food hypersensitivties) – we suggest that you do everything you can to strengthen your body's natural resistance to environmental stresses. An analogy for this might be that of strengthening your muscles with appropriate exercises rather than solely depending on treatments for your heart or other organs after they've become ill as a consequence of your not exercising. Becoming more energetically robust is the key to managing electromagnetic pollution. It can be difficult, at times, to not see "out there" as the problem or source of our problems. 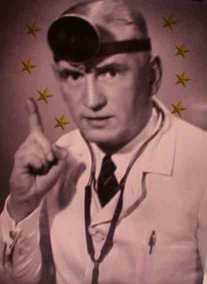 But even in the face of such extreme provocation as microwave antennae and mobile phone emissions, there are always things you can do to progressively decrease your sensitivity and increase your energetic 'immunity' from such toxins. The Energy Egg and Guardian Angel are a good foundation which we can then build on through your own, individual, Energy Solutions. "The Energy Solutions consultation has been very useful... a dramatic effect on my health and wellbeing and in particular my available energy." “The Energy Egg is so powerful – I definitely felt a jump in my energy when I received it. Since then, my bronchial condition has been so much better, I’m sleeping better and my joint pain is better. This amazing new product is the ideal way to recover your energy. We recommend purchasing the Energy Egg with the Transmitter, because this is the strongest and most convenient option — and the best value! Other Currencies [approx]: GBP£45:00 — Euro €55:00 — AUD$90:00. Your currency will convert automatically from USD on PayPal. The NEW WHITE JADE Energy Egg offers up to five times as much protection from wifi and other peoples energies. This Energy Egg is recommended for anyone who works with others or who feels particularly vulnerable to other peoples energies. We recommend purchasing the White Jade Energy Egg with the Transmitter, because this is the strongest and most convenient option — and the best value! Other Currencies [approx]: GBP£61:50 — Euro €75:00 — AUD$110:00. Your currency will convert automatically from USD on PayPal. The Energy Egg also works without the Transmitter, but in this case you need to keep it close to your body at all times. Also if you later decide to buy a transmitter, the cost will be higher. Purchased without the Transmitter, the Energy Egg costs $50.00*. The White Jade Energy Egg also works without the Transmitter, but in this case you need to keep it close to your body at all times. Also if you later decide to buy a transmitter, the cost will be higher. Purchased without the Transmitter, the White Jade Energy Egg costs $77.00*. The Transmitter purchased separately costs $35.00*. A Guardian Angel home environmental stress eliminator is the most advanced, whole home, space clearing instrument available. These have the same life-enhancing effects on everyone in the space as if they had their own personal Energy Egg – and more! The Guardian Angel (including base) costs $380:00*. Other Currencies [approx]: GBP£227:00 — Euro €270:00 — AUD$390:00. Your currency will convert automatically from USD on PayPal. The super-heavy-duty Archangel makes the most potent addition to large houses, apartment blocks, offices, shops, restaurants, practices or any environment of a substantial size or where many people are in and out. These have the same life-enhancing effects on everyone in the space as if they had their own personal Energy Egg – and more! The Archangel (including base) costs $630.00*. Other Currencies [approx]: GBP£387:00 — Euro €450:00 — AUD$640:00. Your currency will convert automatically from USD on PayPal. We are so confident you will experience benefits from the Energy Egg, Guardian Angel, or Archangel, we offer a 12-month money-back guarantee!